Emitting a Recibo Verde when working as a self-employed entrepreneur in Portugal is easier than it seems. First of all you have to make sure you have your access code for the Finanças portal. If you live in Portugal you normally already have a NIF and access to this website. Then you just have to connect to the site by clicking here. 2. Log in with your NIF and your personal password. If you do not have a password yet, apply to Novo Utilizador (New User). The code will be sent to your address in a few days. You have 3 options. The most common is Fatura-Recibo which corresponds to the issue of an invoice / receipt for a service or service rendered. Your personal information will already be filled. 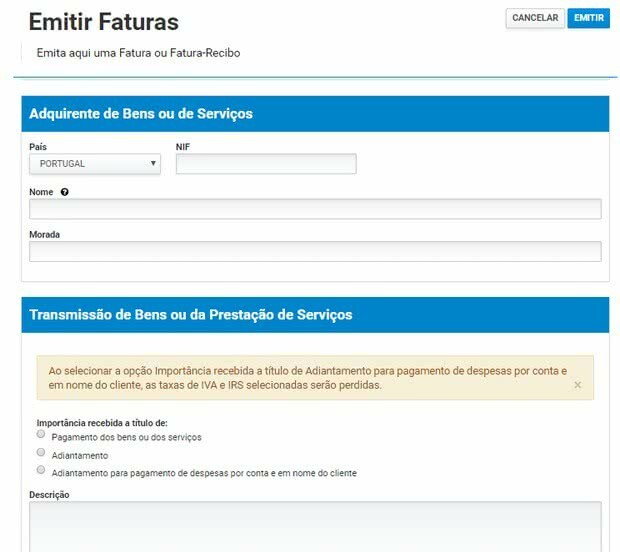 Select the kind of activity of the service (if you have different activities and you want to change the activity you are registered to, you must click on Entregar> Declarações> Atividade). Enter the value of the service / work provided. If you have category B (if you live and work in Portugal as freelancer) and if your total annual income is less than € 10,000, you are exempt from VAT under Article 53 of the VAT Code. You may be exempted for other business reasons and you should check your activity in Article 9 of the VAT Code. You are exempt, that is to say not taxed, if the total annual amount has not exceeded 10,000 cumulated ("Dispensa de retenção – art. 101.º-B, n.º1, al. a) e b), do CIRS "). The article governing this waiver of detention is article 101-B of the CIRS. Before the changes to the green receipts of January 2016, it was possible to select "without retention, artº 9º, nº 1 of DL nº42 / 91, of 22/1". In other cases, you must choose the base at 100% (there are special situations, such as the different categories whose base is 50% and the disabled disability of more than 60% with a base of 25% ). If you are not exempt, there is IRS retention whenever the entity to which you issue the bill makes its accounts (declares its expenses to Finanças). You must select the retention rate (generally the amount to be withheld is 25% for the IRS Class B taxpayer and the simplified plan). You can check your status in Dados Pessoais, Outros Dados de Atividade (Personal Data, Other Activity Data), in the upper right corner of the page. Generally, the Imposto do Selo (stamp duty) is empty or void, being used only in notarial deeds. Select in "A título de" your case, which is most often "Pagamento dos bens e dos serviços" (Payment of goods and services) (before the change of the green receipts of January 2016 this field was called "Fees"). 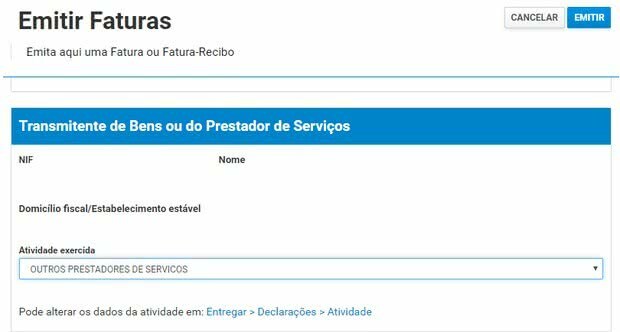 You can view all receipts issued from Consultar> Faturas e Recibos Verdes> Consultar (View> Invoices and Green Receipts> View), select the desired receipt and click on Imprimir (which also allows you to save the pdf). Now live and work in Portugal as freelancer is easier. If you have any question do not hesitate to register: it's free! Lisbob is Expats Personal Assistant in Lisbon and Portugal. Check out how he can help you ! Newer PostAm I entitled to unemployment benefits in Portugal?